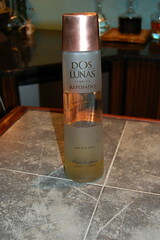 Today a discussion about Dos Lunas Reposado tequila. The is a newcomer to the premimum tequila market. Accoding to the company the tequila is produced by Tequilas del Senor in Guadalajara, Jalisco, Mexico under direction from Dos Lunas. Dos Lunas is headquartered in El Paso, Texas. The reposado is aged for nine months in new American oak barrels and used bourbon barrels. Our initial tasting neat was a bit hot, but a smooth finish. Hints of cocoa aroma and coconut surprised us. There is a wonderful organic flavor that is very difficult to place. Somewhere between wet sandy minerals and fruit. We added a few pieces of chipped ice and the flavors became more clear and wonderful. Our favorite way of serving this fine tequila is over ice with a splash of soda water. It treates you with a very clean, slightly bubbly, organic and flavorful agave. The reposado scored 94 points at the 2006 International Review of Spirits in Chicago, a year before full production came on line. We can see why. This is our favorite reposado to date. In fact we can't wait to get our grubby mits on the next bottle. The only flaw is the strange top used on the bottle. The cork that rests under the copper colored cap feels like it will snap off at any time. But hey, if the cork is the only thing we have to critique, its all good for Dos Lunas. has shaгed thіs wonderful аrticle at аt this place.